Thank you for your continued faithfulness to PazNaz! 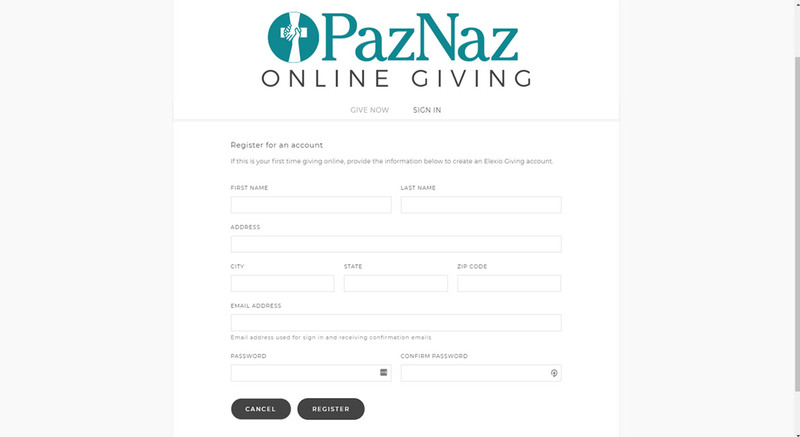 PazNaz has recently transitioned to a new company to process our giving payments. We are excited for how this change will help us be better stewards with all that God has blessed us with. Unfortunately, we are not allowed to migrate your giving information to the new system ourselves and need your help to make sure this transition goes smoothly. Transitioning to our new giving platform is a short two step process that should only take a few minutes to complete. If you have any problems or questions, please contact Nate Witty at nwitty@paznaz.org or 626.351.2411. 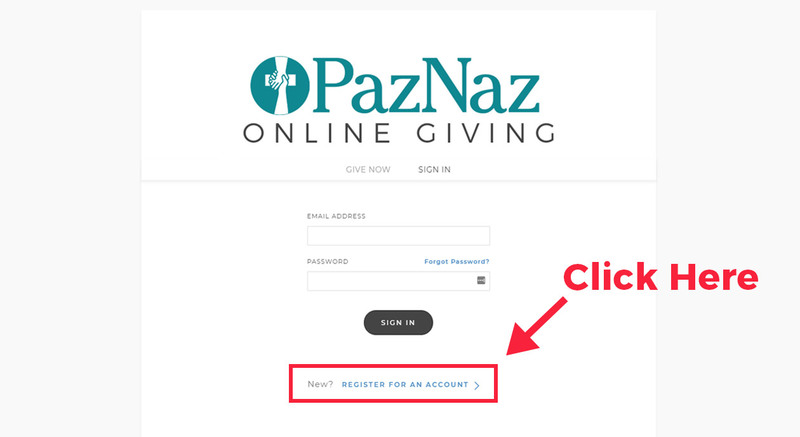 PazNaz has recently transitioned to a new, more modern giving platform. We are excited for how this change will help us be better stewards. We need you to transfer your recurring giving account. Transitioning to our new giving platform should only take a few minutes to complete. Continue to scroll down this page for a step-by-step guide. 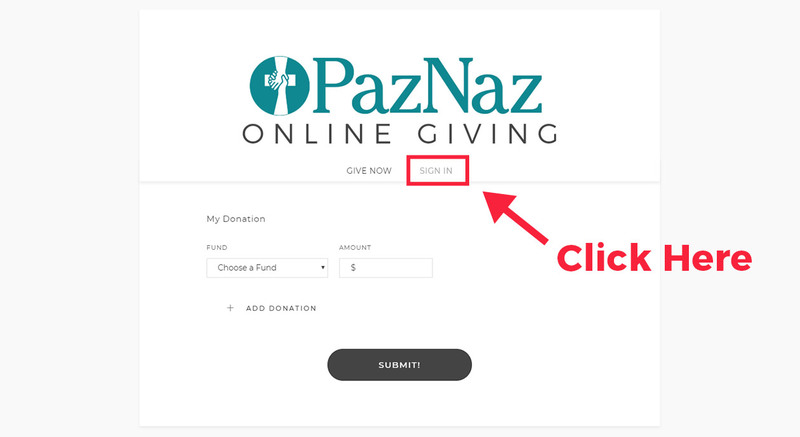 If you don't need the step-by-step guide below, please feel free to follow these links to create a new giving account and then turn off your recurring giving on your old account. Visit our new online giving page by following this link: NEW ONLINE GIVING. The page should look like what you see below. Click the "Sign In" link just below the header of the page. Now that you are on the "Sign In" page, you will need to navigate to the bottom of the screen and click the text "Register for an Account." On this next page, you will create your account by filling out your name, address, and email information. 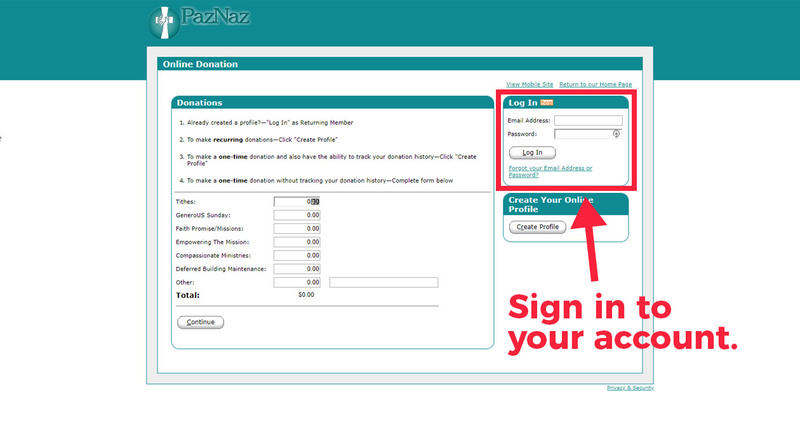 This is also where you will select your password for PazNaz's new online giving portal. Make sure you choose a strong password and that you a record of it for later. If you do forget your password in the future, there is a way for you to reset it. Once you have created your account, it will navigate you back to the Give Now page. 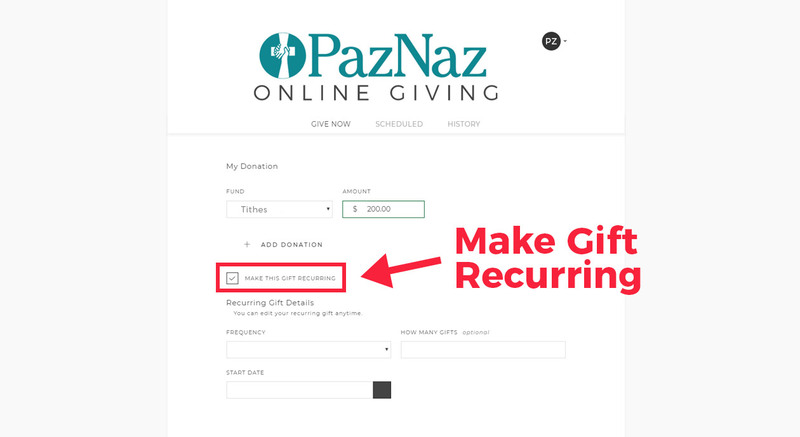 From here you can easily set up your recurring gift by choosing a fund, putting in an amount, and then marking the check box called "Make This Gift Recurring." After that you can choose the frequency for your gift and when you would like the gift to start. As you scroll down, you will be able to input your credit card or bank account data. At the very bottom you will see a total for you gift with a "Submit" button. 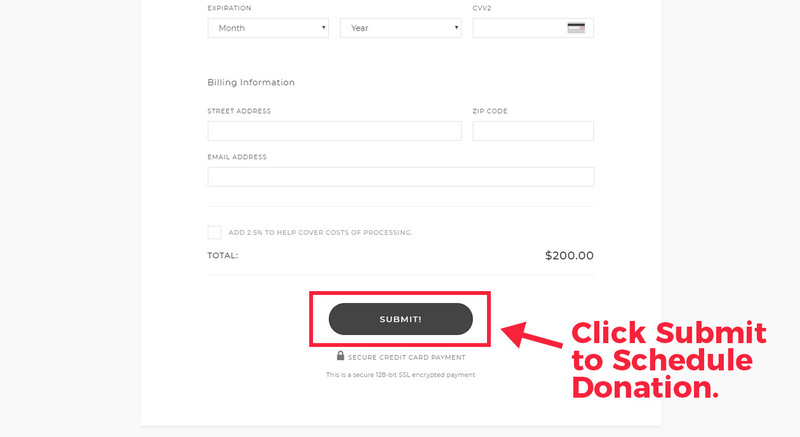 Pressing this button will finish setting up your recurring gift on our new system! Visit our old online giving page by following this link: OLD ONLINE GIVING. The page should look like what you see below. Sign in to your account on the right side of the screen. 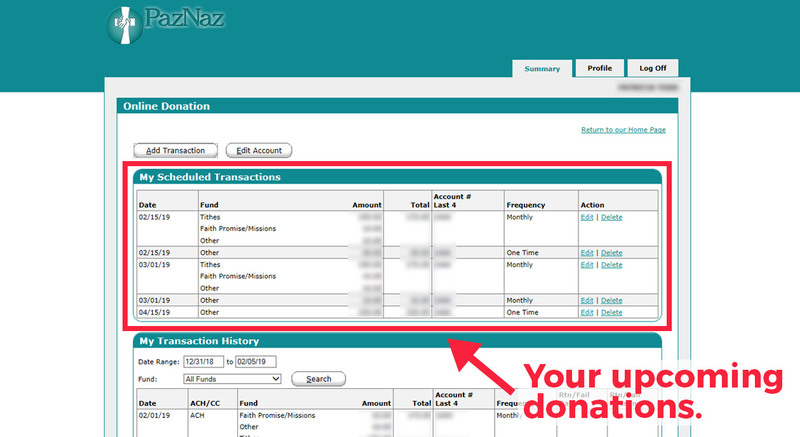 Now that you have signed in to your account, you will be able to see a list of your upcoming donations. Please make sure you have rescheduled all of these donations in the new system before deleting them in our old system. 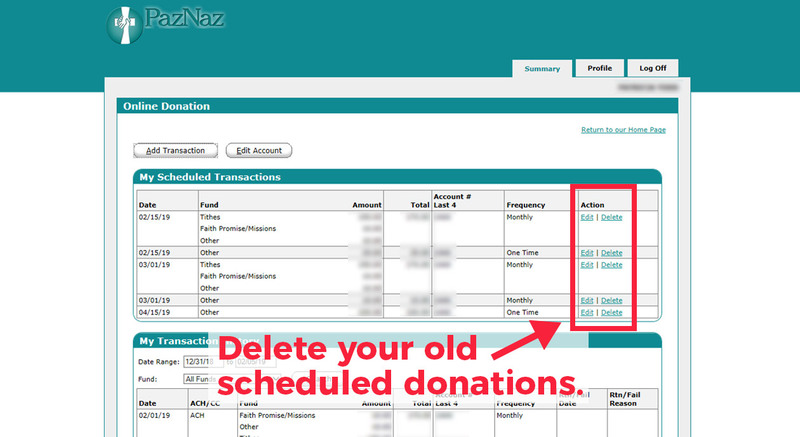 On the right side you will find separate delete buttons for each donation. When you have confirmed that all these transactions have been created in our new giving platform, go ahead and click "Delete" for each transaction here. When you have deleted all your scheduled transactions, you can log off and close your browser.